Staying young and active throughout our entire lifetime is something we all aim for. We want to be able to do what we want, when we want to do it. Playing with our kids, traveling, jogging, hiking, and enjoying time with family, friends, and loved ones really gets to the core of what life is all about. Unfortunately, as we age, many of us will deal with a muscular condition called sarcopenia, which is defined as a gradual loss of muscle mass, strength, and function. In essence, it is an atrophying (or shrinking) of our muscular system over time. This condition can be hard to detect and typically progresses so slowly that we don’t realize we have it until we say those dreaded three words: “I’m getting old.” But is it really the fact that we are just “getting older” or is it just that we are not taking care of our muscular system as we should? For most of us, it is the latter and the good news is that we can begin to reverse this process starting today. All it takes is adopting certain healthy lifestyle habits and remembering that you have the power to stay stronger and feel younger for the rest of your life as long as you make it a priority. Between the ages of 30 and 60, the average adult will gain 1 lb of fat and lose ½ lb of muscle yearly if they do not exercise and stay active. While a ½ lb. of muscle loss each year may not sound like much, it adds up over time and this loss of muscle (combined with the increase of fat) can ultimately lead to both less strength and a slower metabolism. To build aerobic capacity and improve your cardiopulmonary system, start with a brisk walk, bike riding, hiking, or even jogging. According to the Centers for Disease Control and Prevention (CDC), just 150 minutes of brisk walking a week can bring significant health benefits. When it comes to muscles, the most important thing to realize is that they need to be used and exercised to stay healthy. One of the first ways we learned of the importance of muscle stimulation was by observing astronauts. According to NASA studies, the lack of resistance from gravity in space causes astronauts’ muscles to atrophy at an accelerated rate. Even with diligent exercise, they simply don’t use their muscles enough to keep them from weakening as they float about their shuttle. Although we at least have gravity on Earth to challenge our muscles, the lessons we’ve learned from astronauts’ struggle with muscle loss are certainly applicable to us back here on the ground. Gravity alone is not enough to keep our muscles strong. Muscle growth is essentially an ongoing process of stress and recovery. To make sure we stay in top shape, we must be physically active throughout our lives and incorporate some form of resistance (strength) training into our exercise regimen. Resistance training has been found to positively influence the neuromuscular system, hormone concentrations, and protein synthesis rate. Nowadays, training with weights has become more commonly prescribed because it strengthens the muscles. There are various ways to engage your muscles and build long-lasting strength (even certain cardio activities like biking or swimming can build muscle), but one of the more time-efficient methods for building and maintaining your muscle mass is a form of exercise called high intensity training (HIT). HIT is a logical method for sequentially engaging, stimulating, and exhausting all muscle fiber types within a short period of time). The speed of movement during each repetition is very slow; 10 seconds to lift the weight and then lower the weight in 10 seconds. This slow speed of movement does two things; it makes the exercise safer by controlling the forces imposed on the joints while at the same time making the exercise harder by eliminating any momentum that can make the work easier on the muscle fibers. Stretching your muscles on a daily basis helps maintain your body’s normal range of motion. If there is an extended period of inactivity, muscles will become shortened, stiff, and sore, and nerve fibers can become irritated. We also begin to lose the normal elasticity in our tendons, ligaments, and fasciae tissue as we age. A regular program of stretching will lengthen your muscles, invigorate your spirit, and help prevent exercise and age-related shortening of the tissue. When starting your stretching program, gently hold the stretch for 30 seconds and stretch each muscle group 3 times. Muscles need protein, stimulation, and the right hormone levels to facilitate the growth and rebuilding process that helps keep our muscles feeling strong and young. When we get older, our protein requirements are actually higher than they were when we were younger. Many older adults don’t raise their protein intake, though, and when you combine insufficient protein levels with inadequate physical activity, our muscles can lose strength. You can make sure you’re eating quality protein by getting it from foods like lean meats, eggs, fish, low-fat dairy, nuts, and seeds. Generally, we don’t lose our ability to use protein that we get from food over time. Our body makes certain proteins by itself, though, and this ability can diminish with age. Optimizing your daily protein intake, with healthy, quality protein sources like the ones listed above, can improve your health, boost the immune system, aid in healing wounds, and help control blood pressure. The final component of keeping muscles strong is ensuring that our hormone levels don’t drop too sharply as we age. We typically associate the hormones estrogen with women and testosterone with men, but did you know that women also produce testosterone and that it is critical for developing muscle mass and strength? Testosterone, IGF-1 (Insulin-like growth hormone), and other hormones play a major role in protein production, synthesis and use. As the concentration of these hormones found in our bodies begins to decline (a normal part of the aging process), we lose much of our ability to produce and maintain muscle mass because our body stops making as many of its own proteins as it used to. Fortunately, there are some tricks to naturally enhance the hormones you’ll need to stay strong. Consuming about 20 grams of protein in an easily digested source(such as skim milk with a touch of sugar) up to 45 minutes before a workout and 30 minutes after the workout maximizes your hormone response and builds and protects your muscle mass. That’s why chocolate milk is a favorite amongst competitive athletes! Taking carbohydrates during exercise (such as sipping a high-quality electrolyte drink) keeps your testosterone levels up and cortisol levels down; the perfect environment for building muscle and making sure that your body doesn’t use muscle for fuel during the workout. It’s important that your body is using carbs and fat as fuel, not the muscles you work to protect. While the most important part of keeping your muscles strong is engaging in consistent resistance training, many people use natural supplements to maintain muscle strength, protein, and hormone levels. A safe, natural hormone-enhancement supplement is DHEA (dehydroepiandrosterone). 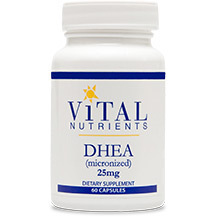 DHEA is a naturally-occurring hormone that our bodies can turn into growth hormones like testosterone. Our body produces DHEA abundantly in our youth, but declines steadily with age. Some researchers theorize that lowering DHEA levels could be what leads to age-related conditions like sarcopenia and osteoporosis. A study published in the American Journal of Physiology tested DHEA supplements on a group of elderly men and women and found that, while DHEA alone did not do much, DHEA amplified the positive effect of resistance training on muscle strength considerably. Amino acids are also promising as a natural supplement that can aid in the maintenance of muscle strength as we age. Amino acids, specifically the branched chain amino acids (BCAA), are the “building blocks” of protein and muscle tissue and play a major part in physiological processes. Over the years, scientists have been particularly impressed with the ability of one of the BCAAs, leucine, to augment muscle mass. A study in the Journal of Nutrition found that leucine has the ability to stimulate muscle protein synthesis following exercise. BCAAs are not synthesized by the human body, and must be acquired through diet, which places them in the category of essential amino acids. Leucine is found in egg whites, soy protein, game meat, chicken, turkey, and tuna fish, but not so much in other protein sources like beef, pork, crustaceans, Greek yogurt, cottage cheese or legumes. Supplementation with BCAA prevents the breakdown of proteins and may possibly aid in their build-up as well. While these supplements may help, exercise truly is essential. The combination of regular exercise and a well-rounded, complete nutrition regimen can help you feel younger and stronger regardless of age. One of the best ways to ensure that you stay active for your whole life is to always keep moving and doing what brings you joy. So get out there, enjoy what you do, and do it as much as you can; the rest will take care of itself. DHEA is a hormone produced by the adrenal glands and is a precursor to androgens. DHEA, along with other adrenal hormones, affects metabolism, immune response, energy levels, and estrogen and testosterone levels. Playing with our kids, traveling, jogging, hiking, and enjoying time with family, friends, and loved ones really gets to the core of what life is all about. Unfortunately, as we age, many of us will deal with a muscular condition called sarcopenia, which is defined as a gradual loss of muscle mass, strength, and function. In essence, it is an atrophying (or shrinking) of our muscular system over time. This condition can be hard to detect and typically progresses so slowly that we don’t realize we have it until we say those dreaded three words: “I’m getting old.” But is it really the fact that we are just “getting older” or is it just that we are not taking care of our muscular system as we should? For most of us, all it takes is adopting certain healthy lifestyle habits and remembering that you have the power to stay stronger and feel younger for the rest of your life as long as you make it a priority. Muscle growth is essentially an ongoing process of stress and recovery. To make sure we stay in top shape, we must be physically active throughout our lives and incorporate some form of resistance (strength) training into our exercise regimen. Resistance training has been found to positively influence the neuromuscular system, hormone concentrations, and protein synthesis rate. The final component of keeping muscles strong is ensuring that our hormone levels don’t drop too sharply as we age. We typically associate the hormones estrogen with women and testosterone with men, but did you know that women also produce testosterone and that it is critical for developing muscle mass and strength? As the concentration of these hormones found in our bodies begins to decline (a normal part of the aging process), we lose much of our ability to produce and maintain muscle mass because our body stops making as many of its own proteins as it used to. Fortunately, there are some tricks to naturally enhance the hormones you’ll need to stay strong. Taking carbohydrates during exercise (such as sipping a high-quality electrolyte drink) keeps your testosterone levels up and cortisol levels down; the perfect environment for building muscle and making sure that your body doesn’t use muscle for fuel during the workout. While supplements can help you maintain (and even build) your muscle strength, exercise truly is essential. The combination of regular exercise and a well-rounded, complete nutrition regimen can help you feel younger and stronger regardless of age. One of the best ways to ensure that you stay active for your whole life is to always keep moving and doing what brings you joy. So get out there, enjoy what you do, and do it as much as you can; the rest will take care of itself.